It was only supposed to be for fun. I was fortunate to get a VIP slot in the race and with my bargain accommodation (£19 a night Airbnb room) being all of 5 minutes away, I thought I had the perfect plan for 2018. Turn up the the start after a warm up and run up that 1 mile bloody hill in style. Life often plays out differently to what you planned. A few years back I ran the 10km with my partner and housemate. Neither had much experience of running up anything…. Milton Keynes is famous for its, roundabouts. A lack of undulation is very well known, the snow dome being visible from miles away. The result of this run was a very stiff talking to, some kinder words of encouragement and finishing pretty much as the race was being put away. There certainly weren’t any crowds. After walking up to the new registration location, collecting my number and 4 pins, it was time to suit up, break out the foam roller and ball, ease those muscles back into life, after 1 1/2 days on my feet around the festival and jog to the start line. The race was due to start at 11 and I thought, stupidly, that turning up at 10.50 would leave plenty of time to bag a good starting position. You may recall I did this at the Ring of Steall in 2018 and 2017, along with countless other races. The next minutes were spent meandering past people, in an effort to get passed as many people as possible to get closer to the start line. Progress was pretty decent, however, the density of people increased and my confidence dropped. Frustrated I acknowledged I would be starting some way back. I knew I was never going to win, that wasn’t possible, but being able to run my own race, against a similar ability was my goal. After hearing Lee Procter had handcuffed Adam Perry to the start line, dressed in a glorious flowery dress (his stag do), the race set off. I crossed the start line, started my watch and set off like a stabbed rat. I’ll be honest, I’d forgotten how steep that initial mile was. I powered up, feeling strong, stride length good, feeling confident. My lungs handled the ascent well, running on the far side of the street, passing a lot of people (the only time I do). It was near the top of the road, just before we turned right onto the fell, that my pace leveled out and those I was now running with would be the people over the remaining 5 miles, I would be duking it out with. Sun in the sky, clouds elsewhere, it was a glorious day. My run down X-Talon 230’s once again a solid choice, with the ground relatively firm but churned up in areas. Heavy set breaths around me, cardio systems working hard, mind working out how hard to go. In all, the first 3 or so miles were up hill, it was only upon hitting the scar, that things leveled out and the group broke up further. The route was stunning, wide vistas of the Lakeland fells far beyond the scar, little sense of civilisation, despite running over a golf course, the street sections as fast as you dared to go on cobbles and greasy steps. The second half suited my road condition legs better, able to turn over fast, handle the cadence and maintain consistency. It would be a sprint finish at the end, after chasing a Helm Hill runner over the last mile. Yes, it could have gone better, a strong start may have generated a shorter time and more sensibly paced effort. 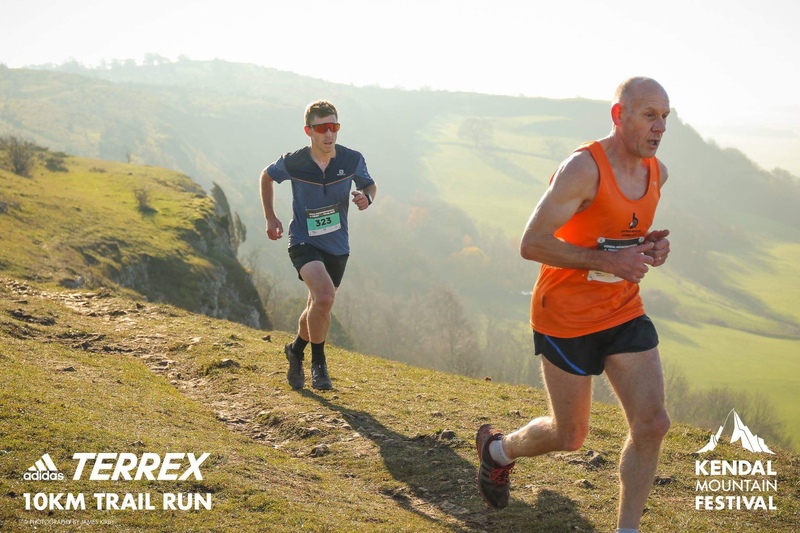 Moreover, the adidas TERREX 10km at Kendal Mountain Festival for me is about inclusion, participation and the entire town joining in the with the festival. You can go all out or take in the surroundings, whether its your first 10km or average training run on a high milage week, it has something for everyone.